The Lisa engine before she underwent her transformation. When part-time firefighter Erwin Walker found out his neighbor was battling cancer, he began looking for ways to help. He not only volunteered to help the family get Lisa Kelly to and from appointments, he went on a mission to learn everything he could about the disease. During his quest, he learned about The Guardians of the Ribbon and their Pink Heals Tour and about the Cares Enough to Wear Pink programs. The nonprofit Guardians organization was founded in 2007 by Dave Graybill, a former pro athlete, retired firefighter and philanthropist from Arizona. Graybill fought fires for 20 years and, during those runs, saw how families were being turned upside down because of cancer. It bothered him that contributions he had made to fight the disease weren’t staying in his city, so he created The Guardians of the Ribbon to address the issue. Walker spent time considering how becoming involved with this group would change both his and Lisa’s lives. When he was sure this was the direction they should go, he began taking steps to start a Southeastern Ohio chapter. The chapter encompasses Columbus, Indianapolis, Lexington, Cincinnati and all points in between, and became a reality in July 2010. Shortly thereafter, Walker purchased a 1989 Sutphen Deluge Pumper that had been ordered new and operated by the City of Hamilton until it was sold in 2010. It boasts a 1,500 gallon per minute pumper, has a 500 gallon tank and is a Detroit Diesel Automatic. In keeping with the Guardians’ custom, the engine was painted pink as a symbol of hope and gratitude and named after a specific survivor who made a significant impact on the movement. On Sept. 26, 2010, Walker and fellow chapter member Bill Strite drove “Lisa” to show it to Kelly and her family for the first time. She had the honor of removing the covers over the name on both doors and on the front. 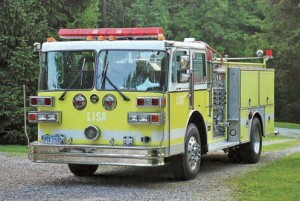 Then Kelly and her family got the chance to take a ride on the Lisa pumper. Her name hasn’t remained the only one on the truck, though. The engines also serve as slates for the signatures of survivors, children, family and friends. Walker said that all of the Guardians chapters use a special industrial ink that won’t come off of the paint. When asked what will happen when Lisa is completely covered with signatures, Walker said she will become a memorial and that they will begin on another fire truck —or on a police car, which some of the chapters utilize. The Guardians organization is made up of public safety and tax-based groups like teachers, parks, police and fire departments and other government agencies. The Southeastern Ohio chapter also works with unions and private businesses. Because they embrace their role of putting women and children first in the battle against cancer, members also created the “Cares Enough to Wear Pink” campaign that sets aside October 25-27 as days for these agencies to show support for the people in the community who have supported them. Kelly, the engine’s namesake and a cancer survivor. 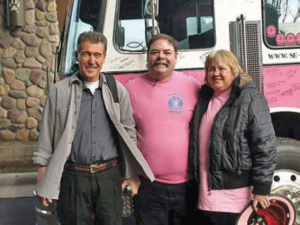 Walker expressed excitement about Mantooth’s support. The Pink Heals Tour is another movement of the organization. 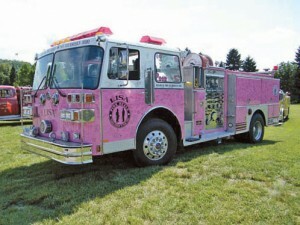 Volunteers drive pink fire trucks and pink police cars and visit hundreds of communities in support of their cause. Walker says the Guardians organization is unique in that the chapters don’t pay into the parent organization and they keep any money they raise so that it’s on hand when needs arise in their areas. 100 percent of the funds required to keep the chapter’s vehicles rolling on the tour and throughout the year come from sales of Guardians T-shirts and other merchandise. One of the major objectives of the chapters is to help other nonprofits by using pink fire trucks and pink police cars at their events. Individuals can also use the vehicles free of charge to help them fund raise for their own medical bills. Walker added that they don’t place plastic collection containers or try to solicit money from people who attend such events. If someone feels the need to give him money, Walker recommends they purchase a T-shirt or other merchandise instead. More information about the Southeastern Ohio Guardians of the Ribbon can be found at www.se-oh-guardian.pinkhealscincinnati.org/ or on Facebook at www.facebook.com/PinkHealsSEOH.